After the Good Friday processions, we returned to San Basilio, Sta. Rita, Pampanga to listen to the Pasyon Serenata. But this time, we proceeded to Maligaya Street which is also in San Basilio, which has its own Pasyon Serenata. As I mentioned previously, the Pasyon Serenata is a variant of the pabasa, with two sets of accompanying singers and marching bands playing alternately in what is called a sagutan. 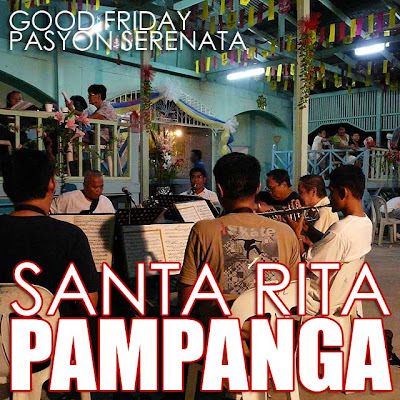 It's held in the evenings (usually 8 p.m. to 12 midnight) of Holy Thursday and Good Friday in two locations in Barangay San Basilio, Sta. Rita, Pampanga. The previous night, we watched the one beside the San Basilio Chapel. Parking and maneuvering is a bit difficult in Maligaya since the street is very narrow. Anyway, we sat down for quite a bit but suddenly felt the exhaustion from all the traveling. So we called it a night quite early.